Will Craig Jones become the first ever Polaris two-division champion? 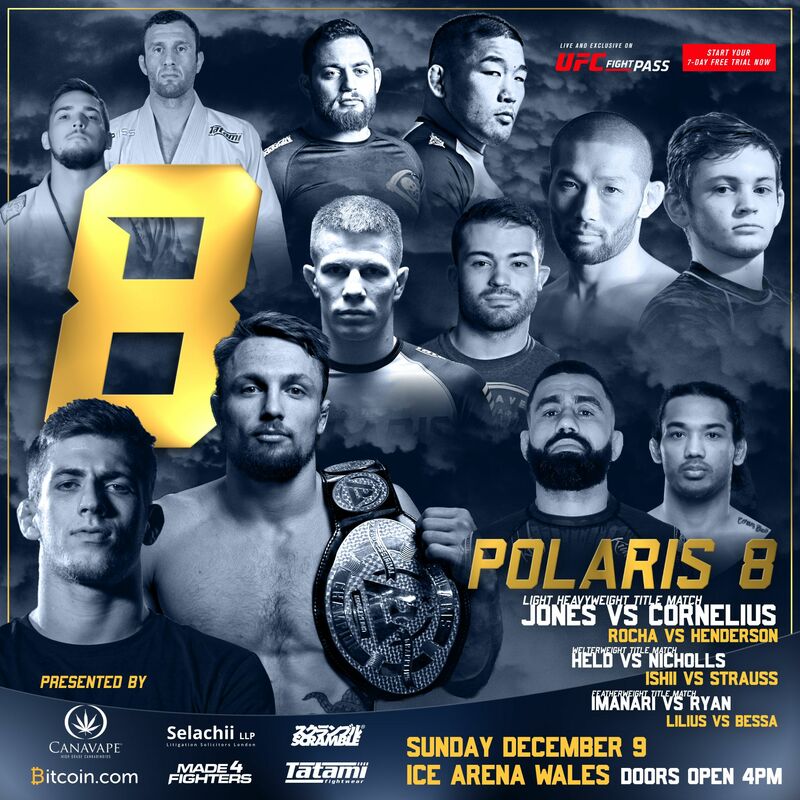 Polaris® 8, the end of year spectacular from world-leading professional jiu jitsu promotion Polaris, will be streamed live and exclusively on UFC Fight Pass® on Sunday, December 9th from the Ice Arena in Wales. The main event sees breakout star Craig Jones move up in weight to challenge one of the most successful jiu jitsu athletes the United States has ever produced in Keenan Cornelius. Jones, the current Polaris middleweight champion, believes he can beat the American and become the first ever two-division weight class champion of Polaris. “Keenan has blue hair and invented the ‘worm guard’ – who doesn’t want to see this man lose?” says Jones, who trains out of Absolute MMA in Melbourne, Australia. Keenan hails from the champion factory of Atos Jiu Jitsu in San Diego, and holds a previous victory over Craig, but the Australian has a track record of scoring upset wins over well-established names in jiu jitsu. In the co-main event, Polaris has brought together two incredible athletes in Vagner Rocha and Benson Henderson. Rocha is a jiu jitsu world champion and the EBI / CJJ champion, with a particularly nasty and brutal jiu jitsu style. Benson Henderson is a legend in MMA and his last appearance in Polaris was non-stop action and excitement. There are two further belts on the line at Polaris 8. Ross Nicholls, a Welshman and black belt under Roger Gracie, will fight in front of his hometown crowd for the Polaris welterweight belt against Marcin Held, the Polish grappling prodigy with a string of submissions under his belt in both MMA and professional jiu jitsu. In the featherweight division, the enigmatic and dangerous leg-locker Masakazu Imanari will look to secure the belt against the young John Danaher prodigy, the seemingly unstoppable Nicky Ryan. Kicking off the card is local legend Pedro Bessa, a Brazilian who settled in the UK many years ago and has a legion of followers thanks to his network of jiu jitsu gyms. He takes on Santeri Lilius, one of the best home-grown European jiu jitsu athletes in the only gi match on the card. Polaris 8 also has a stacked undercard of British names including Brett Johns, current UFC fighter, and Ash Grimshaw, a veteran of the UK MMA scene. Polaris Professional Jiu Jitsu (shortened to just ‘Polaris’) is a professional jiu jitsu show based in the United Kingdom and broadcast to the world. Jiu jitsu in this sense is a broad term that encompasses any grappling style. Fighters can win by submission or by dominating the other fighter throughout the match; there is no striking of any kind allowed. Polaris hosts matches both with the traditional jiu jitsu kimono and without it (‘gi’ and ‘no gi’).With its own innovative ruleset that promotes constant action, Polaris is pushing the boundaries of professional jiu jitsu as both a sport and a form of entertainment. Since its inception, Polaris has played host to jiu jitsu world champions, legendary MMA fighters from America, Japan and Brazil, and the best grapplers in the world.